Ear piercings are discreet and very common, which makes them a good choice for your first piercing. If you’re consider getting your ears pierced and have never done it before, you probably have a few unanswered questions about it. Here’s everything you need to know so you can know what to expect and get your piercing done right. 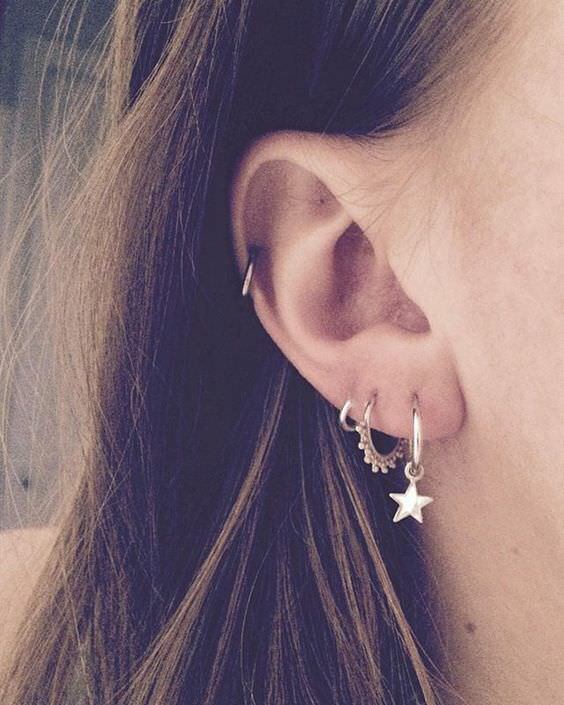 One of the biggest worries people have about their first piercing is whether it will hurt. Every piercing comes with some degree of pain. Still the good news is that ear piercings are some of the least painful ones you can get. Let’s go into a little more detail so you know exactly what to expect. Where you get your piercing will affect the amount of pain you feel. 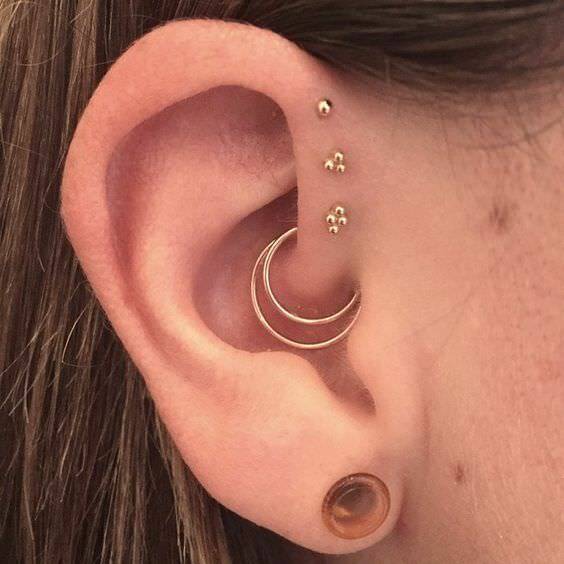 Helix piercings (along the edges of the upper ear) and ear lobe piercings tend to be less painful than conch (a piercing in the inner ear) or industrial piercings (a pair of piercings with jewelry that goes across the inside of the upper ear). If you are getting your first piercing and want to avoid the more painful ones, start by getting your earlobe pierced. It’s one of the most common piercings in part because it is easy to withstand the process. There are really two types of pain that come with getting your ears pierced: the initial pain from the piercing itself, and the subsequent pain after the procedure is finished. The initial pain is sharp but brief. Some people describe it feeling like a strong pinch, though there are some who report a more intense sensation (more on that later). Once your piercing is done, that sharp pain will be replaced by a dull, throbbing one. Unlike the initial pain, this one will last for a few hours. Although it’s long-lasting, it’s a very tolerable sensation, and you might even stop noticing it if you allow yourself to get distracted. Once the initial pain is over, then, you’re left with an annoying sensation. It’s not the best feeling in the world, but it’s easy to put up with and it goes away soon after it starts. Once everything is healed, you should be completely pain free besides possible future impact injuries, and further intentional modifications such as ear stretching. One of the most important factors in how much any piercing will hurt is your subjective pain tolerance. As mentioned above, some people experience an earlobe piercing as an almost painless pinch, while others find it more painful. Regardless of your sensitivity to pain, you can expect the whole thing to be over very quickly. It will hurt, but only for an moment. Most piercings can only be done using a needle. Earlobes are the exception. If you’re getting your ears pierced where there is no cartilage, you can get it done with a piercing gun. If you’ve never wandered into a piercing studio, you might only be familiar with the piercing gun. It’s the go-to option for jewelry stores, shops that sell accessories to teenage girls, and shopping mall kiosks. Let’s look at the differences between the two options and explain why you should avoid getting pierced with the gun. The needles piercers use are sterilized and individually packaged. They’re sharp and hollow, which allows for a quick, clean pierce. The piercer uses the needle to pierce the skin, and they can then insert the jewelry into the piercing. The gun, on the other hand, is a reusable device that does not use a needle of any kind to pierce the skin. Instead, the stud jewelry is inserted into the gun, and the gun pushes the stud through the ear. That saves the additional step of inserting the jewelry, but because the stud is blunter than the sharp needle, it’s also a more painful process. By forcing something blunt through the skin, it essentially tears the skin instead of making a precise pierce. The biggest problem with using a piercing gun is that it cannot be properly sterilized. Although the stud that is used will be new, some blood may have made its way on the gun from previous piercings, which places you at risk of contracting hepatitis and other conditions spread through the blood. It is, of course, possible to clean and disinfect the piercing gun. Yet, this is not the same as sterilizing it and it will not eliminate all bloodborne pathogens. In fact, the Association of Professional Piercers opposes the use of piercing guns for that simple reason: because they are made of plastic, they cannot be sterilized using any approved method. Piercing guns are also easier to use than a needle. It’s designed to allow just about anyone perform the procedure – and that’s part of the problem. If you’re getting your ears pierced with a piercing gun, that means there’s a very high probability that the person doing it has not received proper training in body piercing. Not only might they not do as good of a job with the piercing itself, but they might also not be aware of the risks involved in dealing with blood or be equipped to give you proper advice about caring for your piercing. What About Ear Piercings for Children? Some people will claim that the gun is the better method when piercing a child’s ears. That is simply not true. Children who get their ears pierced deserve to have it done by professionals just as much as adults do. While the gun might look less intimidating, the needle is cleaner, safe, and causes less pain – and what parent wouldn’t prefer that? It’s clear from the last section that you should only work with a qualified piercing professional. Unless the facility has a dedicated, trained piercer, steer clear! You shouldn’t let a jeweler or a retail clerk pierce your ears, even if they can do it at a lower price (it’s not worth the higher risk of getting an infection or having a piercing that isn’t properly aligned). You should always get your piercings – even earlobe piercings – done at a piercing studio or a tattoo parlor that offers piercing services. Although, that doesn’t mean you should blindly trust any of these businesses. Here are a few things you should consider when trying to find a reputable piercer. Getting pierced safely means getting pierced in a clean environment with clean tools. If the facilities aren’t kept clean, then how good of a job are they doing making sure that their tools stay clean? You can get a quick sense for the cleanliness as soon as you walk in. If it doesn’t seem up to par, simply walk out and find another studio. You will want to look for or ask about at least two basic credentials. The first is a business license. Any legitimate business should have one, and it’s likely on display in the lobby. You should also ask what kind of training and certification the piercers have. It’s not good enough to trust somebody because they’ve been doing it a long time; without proper training they might not be up to date on best practices or know the best ways to prevent contamination and infection. Your piercer should be using a needle fresh from the packaging every time and should never use the needle on more than one person, no matter how well they seem to clean or disinfect it. Many piercers will set up their equipment in front of you, so that you can see that everything is sterilized and that the needle has never been used. If they don’t, ask to see them set up the equipment – you can trust your eyes more than you trust a stranger’s word. Review the piercer’s work online. 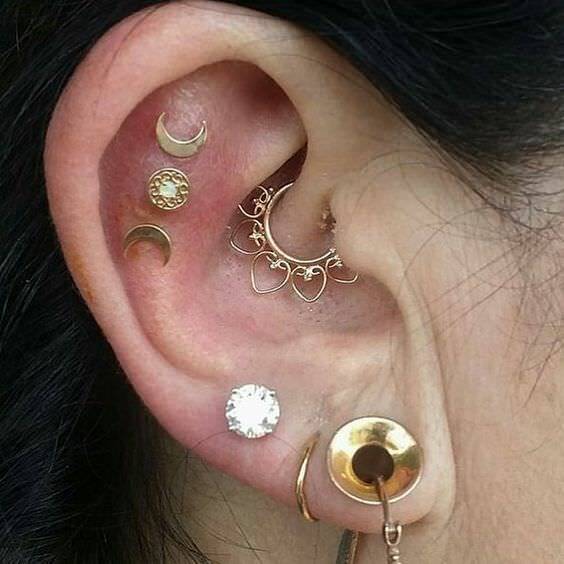 Does their portfolio show a lot of recent piercings that were well done? Check out the more complicated stuff, too. A piercer who does a great job on more challenging parts of the body is likely to do great work on your earlobe. Also check out online reviews or ask around with the people you know. It’s true that you’ll get the occasional crank complaining over something small and inconsequential, but reading reviews can help you identify patterns of complaints or other red flags. Does the piercer seem like they have your best interest in mind or are they treating you like a chore they want to get over and done with? Keep in mind that you might need your piercer’s help figuring out what kind of jewelry to get, how to take care of your piercings, and accommodating any metal allergies you may have. If they’re not generous with that kind of help, you’re better off finding someone who is. Getting a piercing can make people nervous, especially if it’s their first time undergoing any kind of body modification. Find a studio that makes you feel comfortable. Some people are intimidated by piercing studios and tattoo parlors, but friendly staff can make all the difference. If you’ve never had a piercing, you might not realize that not every kind of metal will work well for your body. You’ll have a range of jewelry options made of yellow, white, or rose gold; stainless steel; titanium; and more. 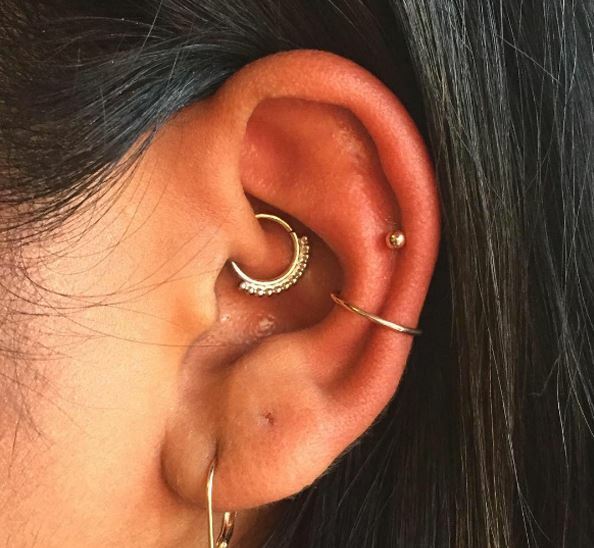 Your piercer might be able to advise you, but for the most part this works by trial and error: you wear one kind of jewelry for a while and if it isn’t healing well, you’ll have to switch to a different type of metal. Nickel allergies are surprisingly common, but many people don’t realize they have one until they get a piercing that won’t heal. It’s best to avoid nickel or nickel alloys altogether by selecting hypoallergenic jewelry. Since you’re getting a new piercing, be sure to select something lightweight so that you heal more quickly. Once your piercing is healed, you’ll be able to upgrade to something heavier. Beyond that, the choices are mostly aesthetic. Pick jewelry that matches your look and personality. Plus, keep in mind that small rings are a bit easier to clean than studs, but studs are still perfectly manageable. A good piercing aftercare routine will do two things: help you avoid infection and help your piercing heal more quickly. 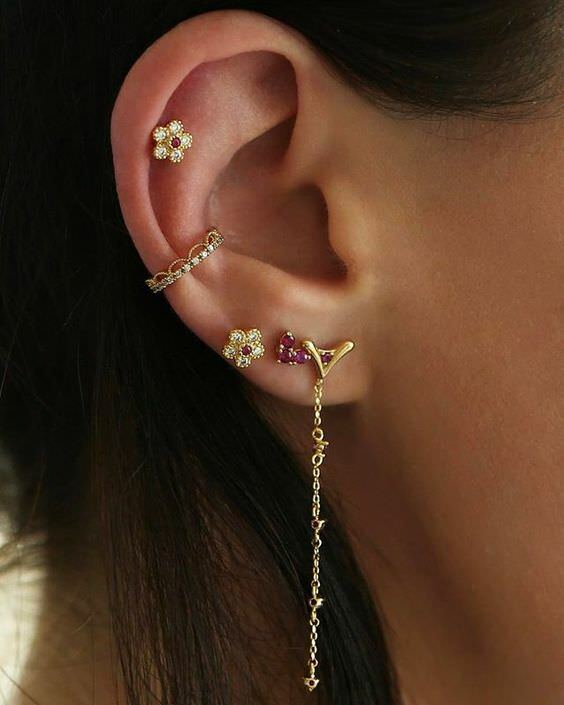 If you follow the right instructions, you can expect your earlobe piercing to heal within one or two months (three months to a year if you’re piercing ear cartilage). Aftercare for ear piercings is quite simple and straightforward. Here are some basic tips you should follow after getting your ears pierced. Make sure not to get hairspray or perfume near your new piercing. Also, use earbuds instead of headphones to avoid transferring bacteria. Hands come in contact with countless bacteria throughout an ordinary day, so make sure to wash them thoroughly before touching your piercing. Use an antibacterial soap to gently wash your ears, preferably twice a day. It’s advisable to use a saline spray on your piercing to keep it clean and help it heal more quickly. You need to exercise some caution here. You can find a lot of recipes online for making your own, but this is risky. The water and the container you use, could all contain bacteria that can then infect your piercing. If you’re going to use saline spray, it’s best to buy a product that is specifically designed to be used on piercings instead of making your own solution. If your piercing gets infected, you might think the right thing to do is to remove the jewelry to let it heal properly. On the contrary, the best course of action is actually to leave the jewelry in and continue cleaning it according to your piercer’s instructions. Taking your jewelry out for any extended period of time while the piercing is still healing, could result in the piercing closing. If it only closes partially, you may have difficult putting the jewelry back in. Your piercing might swell or get painful, which are signs of infection. If the symptoms persist for more than a day, call your doctor to make an appointment. 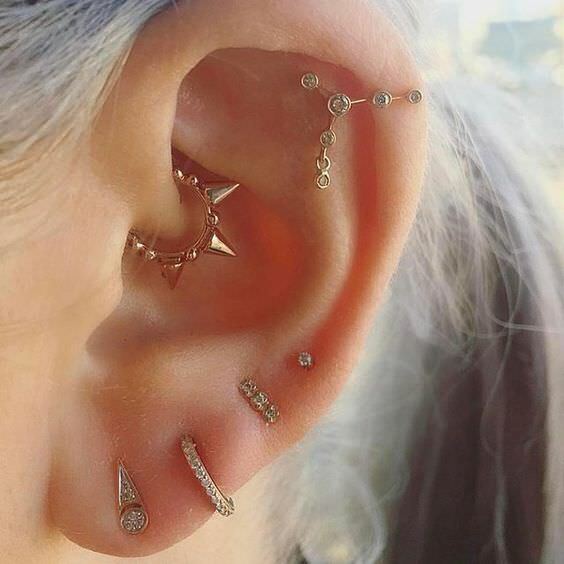 An ear piercing is great on its own or as a “starter” piercing. Just make sure you’re taking the right precautions when getting yours. Avoid getting pierced at the mall and find a reputable piercing professional instead. Select the appropriate jewelry and be aware that you might need to try a few different kinds until you find a metal that is suitable for your body. Finally, follow your piercer’s aftercare routine to the letter to avoid developing an infection.